MARC Almond has hit back at the haters who claim he 'murdered Bowie' after he performed two of the legend's songs at the BBC Proms. 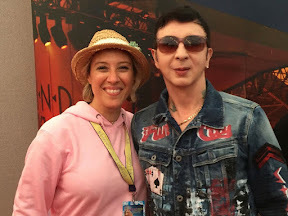 The Soft Cell singer who bumped into theshowbizlion.com at Rewind festival in Perthshire's Scone Palace just last weekend, defended himself after some claimed he sang out of tune and forgot his words on David Bowie's Starman and Life On Mars. He said: "Well if you're given two untouchable iconic classics to sing with totally new arrangements, you have to expect the flak. Stumbling over one word due to sound and nerves in LOM becomes forgetting all the words and singing COMPLETELY out of tune! Love Twitter." He added: "I'd rather listen to Musical experts than some musically ignorant obsessed Bowie Fan and people who just have a problem with me period." "Apparently I'm not a true Bowie fan and have no respect for him or his songs and let down the whole event. Oh please Give me strength. That's why Tony Visconti Bowies friend and Producer asks me to sing at his Bowie shows." The unusual versions of the songs he sang were arranged by Scottish Album of The Year winner Anna Meredith. JUDY Murray was in her element as she put her best foot forward in a new spoof music video. The world famous tennis coach and mum to champs Andy and Jamie took part in the cover of Justin Timberlake’s Can’t Stop the Feeling for The Prince & Princess of Wales Hospice. Just got involved in the video thanks to Speirs Gumley’s ongoing support of her Tennis on the Road programme, designed to make tennis accessible to children of all backgrounds and encourage take-up of the sport. The film features staff from the Glasgow Speirs Gumley office as well as the hospice get into the groove at well-known city landmarks, from the Hydro and Kelvingrove Art Gallery & Museum to Hampden, the Science Centre and Kelvingrove Bandstand. It's hoped it will raise £10,000 for the hospice’s Brick by Brick Appeal to build a new home at Bellahouston Park. The film was made to be shared on social media and drive donations to the hospice’s JustGiving page – www.justgiving.com/cantstopthefeeling. Donations of £5 can also be made simply by texting DANCE to 70660. The hospice’s Brick by Brick Appeal is raising the £21m needed to build a new, purpose-built facility in the city’s Bellahouston Park. The foundations go down this summer and patients are expected to move there in 2018. The aim is to bring 21st-century hospice care to the people of Glasgow, a major step forward in the provision of palliative care services, providing the flexibility to develop and improve services and lower the age limit of patients to 15 years and over. The video was the brainchild of Lorraine MacDonald, owner of Speirs Gumley, who was soon inundated with volunteers who loved the idea and wanted to be involved. Speirs Gumley is part of the hospice’s 50-10 Club: 50 companies who have agreed to raise at least £10,000 each for the new hospice. Speirs Gumley has already raised £4000 and decided to take an innovative and fun approach to raising the remaining £6000. Lorraine said: “We have been long-term supporters of The Prince & Princess of Wales Hospice and our team wanted to do something a little bit different to raise much-needed funds for the appeal. Thanks to a comedy night, we are nearly half-way to our target but wanted to do something a bit different to raise the remainder, and hopefully more. XTRA, XTRA - READ ALL ABOUT IT! IRN-BRU'S LATEST STAR. IT'S the first new permanent product from IRN-BRU in 35 years and theshowbizlion.com got an exclusive taste. Admittedly we weren't dressed for the occasion - having being pleasantly interrupted during daily bootcamp complete with mud face mask - and we were lucky enough to get can number six in the production line. As a long time lover of Scotland's other national drink we couldn't wait to get a taste and for those who like some extra pinch without the sugar XTRA delivers. In the making for over a year, it has been created using the distinctive BRU recipe known only to owner Mr Robin Barr himself, his daughter Julie and only one other employee. It includes even more of the IRN-BRU taste that consumers love but leaves out the sugar for a new flavour experience. 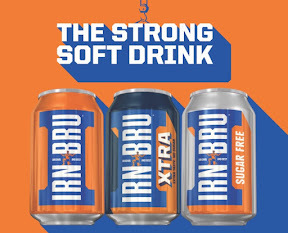 Only the third permanent variant to be added to the range, IRN-BRU XTRA is set to take Scotland’s shelves by storm when it is released on August 22. For regular updates from BRU, follow @irnbru.